A few months ago, I stopped eating bananas and apples. I had enjoyed them for years, but DayTwo, one of the new generation of high-tech microbiome tests that I reviewed earlier in NEO.LIFE, said those particular fruits weren’t good for me. Since then, my sleep has improved. Coincidence? Recently I tried another new microbiome test, from a company called Viome. 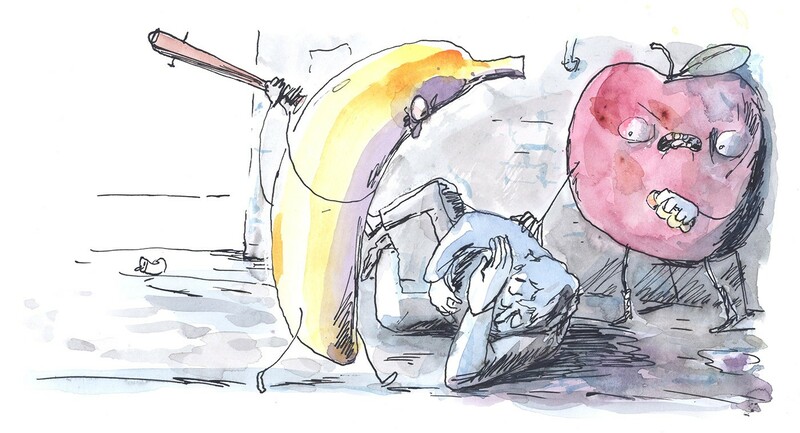 It agrees that I shouldn’t eat bananas. But Viome says I should have an apple or two every day. Who’s right? 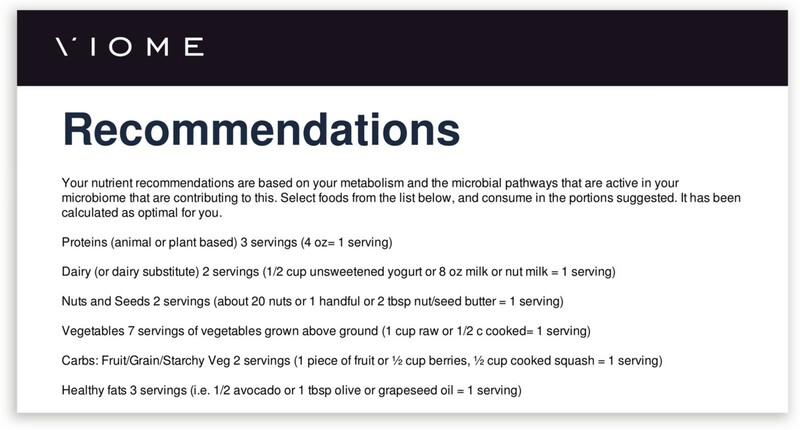 Microbiome diet tests are based on the fact that much of what you eat isn’t fully digested directly by your body. Some of the food is instead broken down and converted to useful molecules by the microbes in your gut, microbes that are different from person to person. It’s part of the reason why doughnuts will make most people gain more weight than walnuts—even if both servings have the same number of calories. It’s also why changing my diet might have helped me sleep better: bacteria in our guts make the precursors to most of the body’s supply of melatonin. And if your microbes are depleted through antibiotics, a food you enjoyed in the past might suddenly cause you an upset stomach. Tests to measure those microbes have been around since 2012 from uBiome, Thryve, American Gut, and a growing number of other companies that use relatively simple “16S” technology. These labs take a small sample of freshly wiped toilet paper and amplify one particular sequence of DNA, the 16S rRNA gene found mainly in bacteria. Because scientists already know which bacteria inhabit normal human guts, just 200 or so letters of DNA per microbe is enough to estimate, roughly, the high-level makeup of your microbiome. DayTwo has extensive and well-reviewed research showing the reasons behind its suggestions. Viome wouldn’t give any documentation for its methods, which it says are proprietary. That’s an astounding achievement for a sub-$100 test, but it misses a lot of detail, so newer “metagenomics” tests go further. For about $300, companies like DayTwo will sequence far more DNA, enough to tell the difference between species and offer a scientifically validated way to tell which foods your microbes like and dislike. At least that’s the theory. I’ve been testing Viome to find out for myself. The out-of-box experience for Viome is pretty elaborate, as befits a $400 test. There are two parts: “gut intelligence” (for sequencing your microbiome) and “metabolic intelligence” (to test your blood sugar). Whereas DayTwo simply asks you to enter the results from your most recent physical, Viome includes an actual glucose meter, with five test strips and lancets, so you can test it yourself at home. The gut test part is similar to any other gut test, though Viome gives you rubber gloves and a fancy disposable sheet of plastic to cover your toilet while you produce a specimen. As with DayTwo, you scoop out a tablespoon or so and smear it into a plastic vial. Yeah, it’s a little gross if you’re not used to it, and this may be the biggest reason people avoid doing the test. Nothing I can do to help you past this step: you’ll just have to do it. Then you answer an elaborate online questionnaire that asks about everything from the foods you eat to your stress levels to your willingness to change your lifestyle. Curiously, I found the questions more general and ambiguous than the ones from DayTwo. “Imagine your life without any health issues. What does that look like to you?” “Do you struggle with poor snack choices?” “When was the last time you felt great?” It’s unclear how much these questions matter to the final result — Viome hasn’t published its research methods — but I presume my answers would make it easier for a human nutritionist to tailor any advice spit out by an algorithm. I slipped my sample into a pre-paid mailer and within a month I had the preliminary results. Actually, the RNA sequencing part was really fast: I had the microbiome breakdown within two weeks. I’m used to other microbiome sequencing labs taking six to eight weeks or more. The recommendations on the other hand, took another three or four weeks, though Viome says the process is now 100 percent automated. The app is delightfully specific: I have a list of “okay to indulge,” “foods to enjoy,” “foods to minimize,” and “foods to avoid.” Viome says I can eat as much salmon as I like, along with eggs, apples, broccoli, garlic, and more. I should avoid white rice, raisins, couscous, and wheat. And on and on through all the food groups. Surprisingly, both DayTwo and Viome correctly identified that I can handle lactose and recommended milk and cheese. Since lactose tolerance is known to be associated with a human gene, not the microbial ones from these tests, it’s impressive that both tests agreed. Most people are lactose-intolerant, so it would have been safer for the algorithms to advise against it. And it wasn’t just me. When I looked at results from other people, both DayTwo and Viome correctly recommended against dairy for those who are lactose-intolerant, but not for others. Viome’s guidance to the author on foods and common ingredients. I wasn’t surprised to see both tests agree on which foods are obviously bad for me, like sugar and supposedly healthier alternatives such as maple syrup, honey, or stevia. Both also say I should avoid potatoes, corn, and bananas. On the other hand, there was plenty of disagreement, and not all of it can be explained by the fact that I took the tests four months apart. DayTwo, whose new ratings rank everything on a scale from 1 to 10, thinks I should enjoy black coffee (excellent, 9.9) and red wine (9.0, very good) but Viome says I should “minimize” them. Both services agree I should limit my beer intake, unless it’s light beer, which DayTwo says is excellent (9.9). DayTwo says I should avoid grains like quinoa because they raise my blood sugar too much, but Viome thinks I can enjoy them as long as they’re whole grain. DayTwo rated tuna and pork as excellent; Viome recommends that I minimize both. The people behind DayTwo have published extensive and well-reviewed research showing the reasons behind their suggestions. In association with Mayo Clinic, they are conducting large-scale trials that could further establish the benefits of their system. Based on the track records of their founding scientists, I’m comfortable being an early adopter, perhaps getting a few things wrong along the way because I understand that’s how science works. Viome’s science is less clear. While metatranscriptome sequencing is very cool technology, the cutting edge is easy to get wrong, and so far Viome gives few details to justify its recommendations. Its website boasts a long list of “peer-reviewed scientific articles” that “helped make Viome possible,” but look closer and you’ll see the details are generic publications from unaffiliated researchers, with no hint at the methods used by Viome itself. In public interviews, its founder and CEO, Naveen Jain, says the company licensed a decade’s worth of research at Los Alamos National Laboratory, where government scientists have been studying the underlying technology for its relevance to national defense, presumably to understand protection against biological warfare. Viome responded politely and quickly to all my requests, but it wouldn’t give any scientific documentation for its specific methods, which it says are proprietary. The company also bucks industry practice and explicitly refuses to give customers access to the raw data, making it impossible to double-check its analysis. 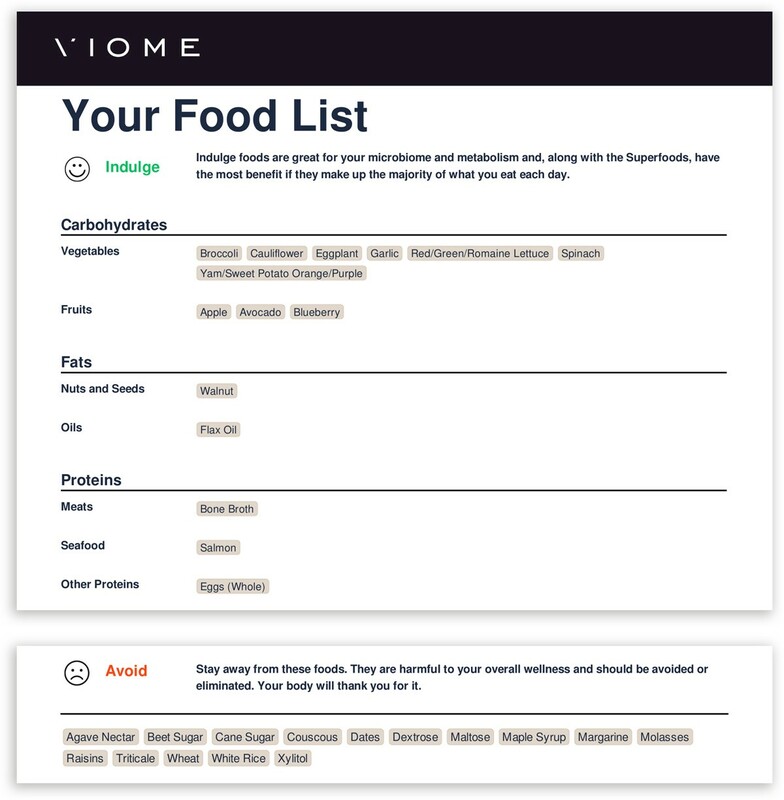 Viome’s nutrition advice was sensible, even without a $400 test. 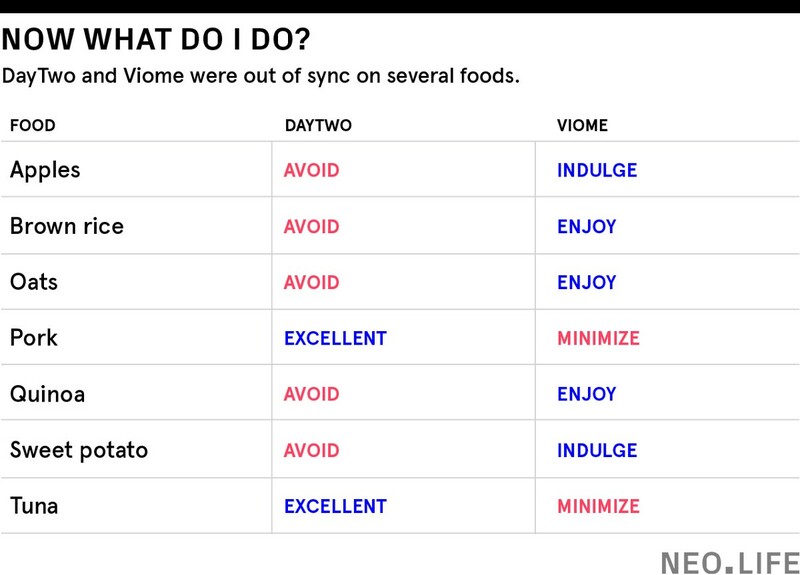 Not that I found any of Viome’s diet advice to be controversial: limit your overall calories, eat more vegetables, fruits, and nuts. If you’re an unhealthy eater today — a binge drinker, say, or junk food addict — you’ll see huge improvements if you switch to the Viome diet, and perhaps the appeal of a high-tech solution will be enough to push some people out of their bad habits. So what about apples? DayTwo says no, Viome says yes. I’m going to start eating them again and see what happens. Richard Sprague is the U.S. CEO of an AI healthcare startup, Airdoc. He once served as “citizen scientist in residence” at uBiome, a microbiome-testing company, but has no current relationship with any of these companies other than being a microbiome enthusiast. This story was updated on March 1, 2018, to elaborate on how the microbiome could affect sleep. Also from NEO.LIFE: What Are Your Genes Telling You to Eat? Companies are using your DNA to customize a diet plan. If it works, it might not be for the reasons advertised.